Catapult Community | Are Cartoons and Fandoms of Today as Progressive as We Think? This term is how I have shaped my view of social justice. As a young black woman, inclusivity is ideal for me, but what happens when the “inclusive” media you consume isn’t as inclusive as you think? I know I’m going to be shunned to kingdom come for saying — well, typing — this, but I don’t like Steven Universe or its fandom anymore. Before you write your angry comments or @ me on my social media accounts, allow me to explain myself. Before “Bismuth,” I tried to ignore the negative racial coding that was slowly creeping up into the progressive liberal foundation that this show had laid. The first instance of this was Sugilite. When this episode was first released, I was too ecstatic at the fact that my (former) fave, Nicki Minaj, was voicing the fusion. 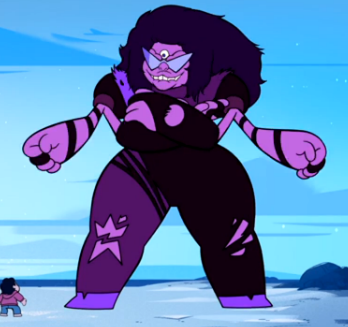 I was in awe by Nicki’s voice acting to really pay attention to Sugilite’s design. It wasn’t until Episode 63, “Cry for Help,” when I noticed an obvious problem with Sugilite. In “Cry for Help,” the Crystal Gems must destroy the Communication Hub (previously destroyed by Sugilite) again after they discover that it has been rebuilt. It is suggested by Steven that Amethyst and Garnet should form Sugilite only to be met with disdain from Garnet as she believes that the two will lose control again since they destroyed the Warp Pad while destroying the Hub. This leads to Garnet and Pearl fusing to form Sardonyx, a stunning gargantuan gem with the charisma of Caesar Flickerman from the Hunger Games franchise. She’s bubbly, yet intellectual — a combination of Pearl and Garnet’s best traits. 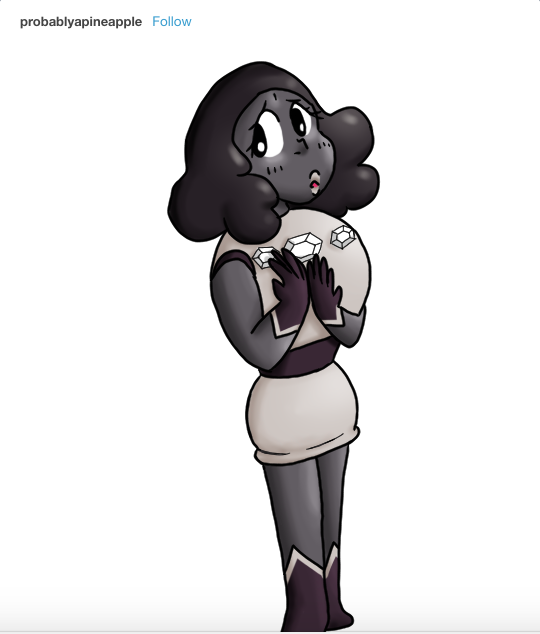 Sardonyx is the complete opposite of Sugilite, and that did not sit well with me. While Sardonyx highlighted the positive aspects of Garnet and Pearl, Sugilite exemplified the worst in Garnet and Amethyst. Now, Amethyst before this point was never really painted in the best light, seeing as she was viewed as “lazy,” and “brash.” When it comes to Sugilite, she is an example of the “Ghetto Black Woman” caricature. She is loud, violent, and heavily uses AAVE (African-American Vernacular English). The last part of that statement is not necessarily bad but for this, it’s a hard no for me. Being voiced by Nicki Minaj does not make any of this better, to be quite honest here. Most already view her the same way as Sugilite, but that’s for another conversation. Now for the nail in my Steven Universe coffin. Bismuth’s episode was not bad at first glance. It is a realistic story of war and how it can affect someone, especially if it was the reason for the loss of their loved ones. Women Write About Comics contributor, Jamie Kingston, perfectly summarizes Bismuth and the evident racial coding by stating, “Bismuth, the Crystal Gem introduced in the episode bearing her name, shares several black coded traits with Sugilite and Garnet. Garnet’s afro racially codes her as black. So do Bismuth’s dreadlocks. […] the first thing she does is take a fighting stance and keen-eyed viewers will realize this may not be our first look at her.” Kingston also mentions how the figure who cracked Lapis’ gem bears a resemblance to Bismuth. What would solidify this moment would be the gem quoting RuPaul’s Drag Race Season 10 queen, The Vixen, and saying “I’m just here to fight.” Throughout the episode, it becomes painfully clear that Bismuth, while genuinely upset, is another casualty to the “angry black woman” trope. The Forge she has is filled with pure weaponry that would make contestants on Forged in Fire weep in shock and awe, but I digress. This episode made me view the show differently, and I could not bear to continue it. While the show was bad in its racism, let’s discuss the fandom. While I was still an avid fan, I was fairly active and aware of the Steven Universe fandom. Heck, I even attempted to cosplay as Rose Quartz, emphasis on attempt. The fans I met were all about intersectionality until Sugilite showed up. As mentioned earlier, the show has been and still is lauded for its queer characters and portrayals of mental illness, abuse, and other heavy-hitting topics. Anyone who knows me in person knows how much I used to talk about the show for its representation of healthy same-gender relationships and gender non-conforming characters. As I was exploring the Steven Universe tag on Twitter fairly recently, I found this tweet. Another instance of the fandom defending the racism exemplified in the show and official print releases was the Concrete controversy. For those of you who are “in the know,” you know exactly what I’m talking about. For those who don’t, let me explain. There was an official artbook that was released that featured print exclusive gems that were unused. One of these gems just happened to be Concrete (which isn’t really a gem but go off I guess). Concrete is a character drowning in Jezebel-like imagery similar to those in 1930’s Warner Bros. cartoons. She is top heavy, has large lips, and…can’t read. Fans of color were obviously furious over this, even after it was revealed that a black male member of the Crewniverse. While black and brown fans were rightfully upset, predominately white fans could not fathom the hatred towards the character or the crew to the point that they took it upon themselves to draw fanart of her. Because of the fact that the crew was being lauded for representation in one area, they disregarded their ignorant actions elsewhere. The fandom had fed their ego, and the fans were serviced as well, creating an exclusionary symbiotic relationship. The second victim of false intersectionality is Voltron: Legendary Defender, another show I grew out of love with. Again, PLEASE HEAR ME OUT! As a girl who grew up with action shows, anime, and giant fighting robots, I was excited about the Voltron reboot coming to Netflix. I thoroughly enjoyed the first season of the show and desperately needed more. Season 2 of Voltron: Legendary Defender gives us an in-depth glimpse into Keith’s past, more specifically the Galra side of him. When it is revealed in Episode 9 of the season that he’s part Galra, Allura doesn’t take this well. To be fair here, the Galra did erase her entire race but…it is what is. Allura refuses to acknowledge Keith’s presence due to her growing xenophobia, Hunk flips out to the discovery and Keith is hurt by all of these reactions. I understand the writers trying to give younger viewers a “teaching moment” about racism, but the show does a poor job at it. Allura is viewed in a villainous and/or naive light, even though her reaction is valid. Hunk’s reaction is timed like a joke. While I can grasp the fact that Hunk’s reaction was a way to show that your true friends will love you very much no matter what/who you are, but it didn’t read that way to me. At the end of the season, Allura apologizes for her behavior towards Keith, and they become friends again! Yay? Fantastic Racism aside, the audience is never given a look into the brown characters of the show until later seasons. The first few seasons focused on Pidge, Shiro, and Keith, giving them in-depth character analyses and growth, while the others were just 2-D shells. Lance was automatically seen as the “incompetent boy who didn’t understand comedic timing,” while Hunk was the “soft teddy bear who loved food just a little too much.” There was nothing more to their characters instead of one-dimensional jokes. Even in Allura’s case, there wasn’t more development on her part until around Season 5. 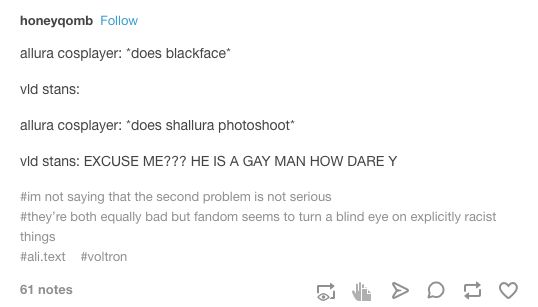 On July 24, 2018, it was revealed at the VLD Panel at San Diego Comic Con that the Black Paladin, the leader of Voltron, Takashi Shirogane is gay. Fans were overjoyed about this reveal because they have been waiting for LGBT representation since the reboot’s genesis. Fanart blossomed across social media. The cast and crew were celebrating the reveal along with the fans. For a few days, there was calm after the long storm. It was also mentioned that we, the audience, would see Shiro’s now ex-boyfriend, Adam, in the show. While it was explicitly stated by Executive Producer Lauren Montgomery that they were exes, “Shadam” fanart made its way onto every computer and phone screen. Once Season 7 was released, the joy soon turned into anger. Well, we were promised Adam, and we got him. Just not in the way we wanted. In the first episode of Season 7, we saw the penultimate moment of Adam and Shiro’s romantic relationship: an argument over the latter’s decision to go on the Kerberos mission that would separate the two for 9 months. The next moment we see of Adam is in Episode 9: his death. If you are aware of media in general, then you have come across the Bury Your Gays trope. It is all too common and frankly, traumatizing to many. Fans came onto social media in droves to comment on the issue at hand — some acknowledged the trope itself while others accused the creators of “queerbaiting” because there was no explicit confirmation of the romantic relationship within the show all while also accusing the crew of confirming heterosexual relationships. Many had the audacity to state that Adam, a racially ambiguous character, was a person of color, even though we know nothing about his character aside from being a pilot and Shiro’s boyfriend. Several fans began to harass the cast and crew, including death threats and more. When the issue of casual racism was first introduced into the show’s canon, countless fans blamed Allura for her actions, even though they were justified. In regard to the characters themselves, predominately white fans tend to exaggerate their traits to the point of being downright racist. This is especially seen with Lance and Allura. The fandom has turned a character who uses humor and slight flirtation to hide insecurities and homesickness into a flat out Latin Lover, a negative stereotype normally associated with Latinos. They also treat him as a bumbling idiot. In Allura’s case, the fandom has been hot and cold with her. When she was first introduced, she was automatically seen as an adult woman, even though she appears as and canonically is a teenager. Members of the fandom immediately labeled her as “Space Mom,” associating nurturing traits with a character that didn’t demonstrate any. The problem with this is the fact that she is brown. People saw a brown girl and immediately labeled her a woman, something black and brown girls have to experience in real life. Now, they have accused her of ruining “precious” MLM ships, predominantly Klance. When fans of color have brought up these racist ways, others have reacted negatively or not at all, proving that issue isn’t of interest to them. The racism might have been brushed aside, but the issue of LGBT representation was not. After the Adam fiasco, fans took it upon themselves to create a Voltron “reboot” featuring an alternative version of Keith and Lance, named Akira and Leandro. The ship “leakira” was soon trending on sites including Tumblr and Instagram. While it was harmless, it became evident that the fandom’s racism hadn’t subsided. The story had changed Keith’s ethnicity from Korean to Japanese. They also tried to include hijabi aliens (trust me, I’m just as confused by that), and they also altered Lance’s last name to be more ethnic. When they were called out, Leakira fans were less than happy about the reaction, accusing critics of “ruining their fun” and being “spiteful” even though the critiques made were and still are completely constructive and fair. I will admit that cartoons today have made more progress in addressing social issues than those of yesteryear. Even so, they too are not perfect. By allowing the creators and vocal parts of fandom to be complicit in casual racism, this could stall the work that is being made. Representation is important for the youth to see but it is only effective if it is truly intersectional. We, as an audience, should not immediately applaud creators (especially white creators) for being progressive even though it is evident that they aren’t inclusive all around. Remember: it’s okay to be critical of the things you love. ...nor did I sleep, much. We all have them, but which topics do more people care about? I am hurting! And I am finding ways to take away the aches by focusing on my body and being more open about my struggles, how about you?